Image Description: a clear plastic-bag with a red-outline around the bag. Up the top of the bag are Japanese hiragana, the word ringo (which translates to apple), underneath the hiragana symbols is the English word “APPLE”. 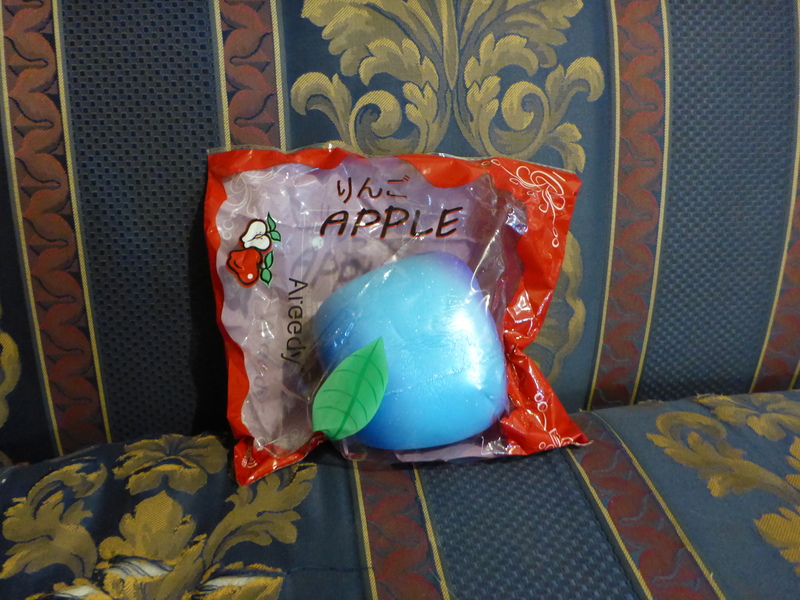 Inside the plastic bag, a large apple with a spectrum of colour, it ranges from dark-blue at the bottom, blue and light-blue in the middle. There are specs of white dotted randomly across the surface of the apple. Image Description: a large apple with a spectrum of colour, it ranges from dark-blue at the top, blue and light-blue in the middle, with purple down the bottom. There are specs of white dotted randomly across the surface of the apple. 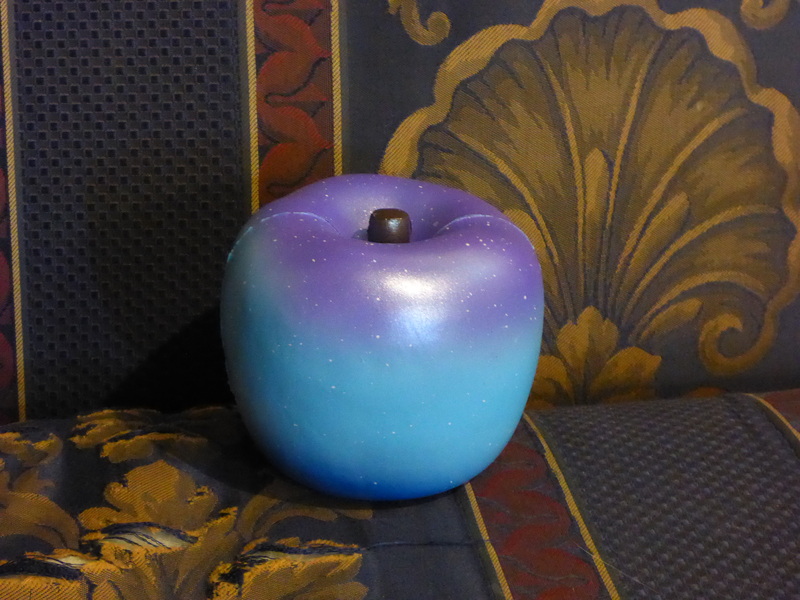 Image Description: a large apple with a spectrum of colour, it ranges from dark-blue at the bottom, blue and light-blue in the middle, with purple up the top with black squishable stem. There are specs of white dotted randomly across the surface of the apple. 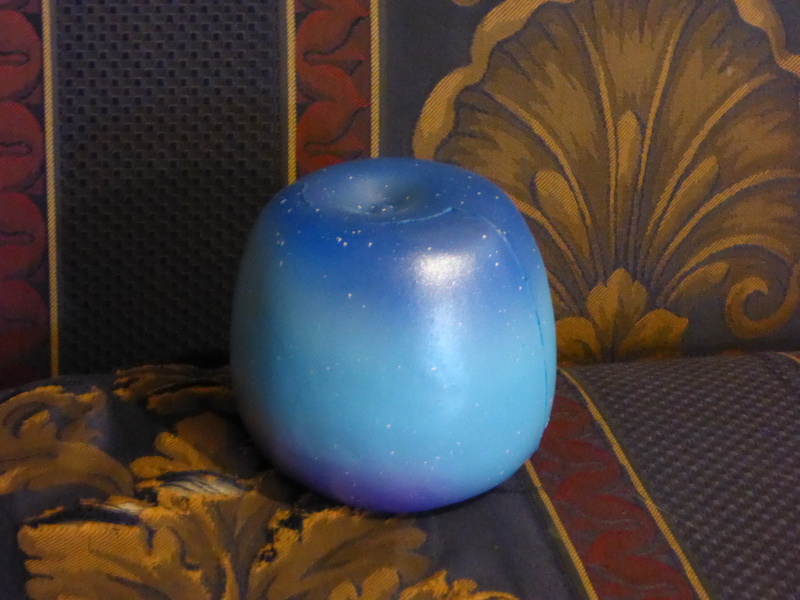 Kim was researching for a replacement Apple Squishy, combined with the popularity of Galaxy-themed stim toys, they recommended this one to me. Naturally, I had to add it to my own personal collection but I decided I should also add this to the stim toy giveaway I plan on hosting for Pushing Boundaries series. 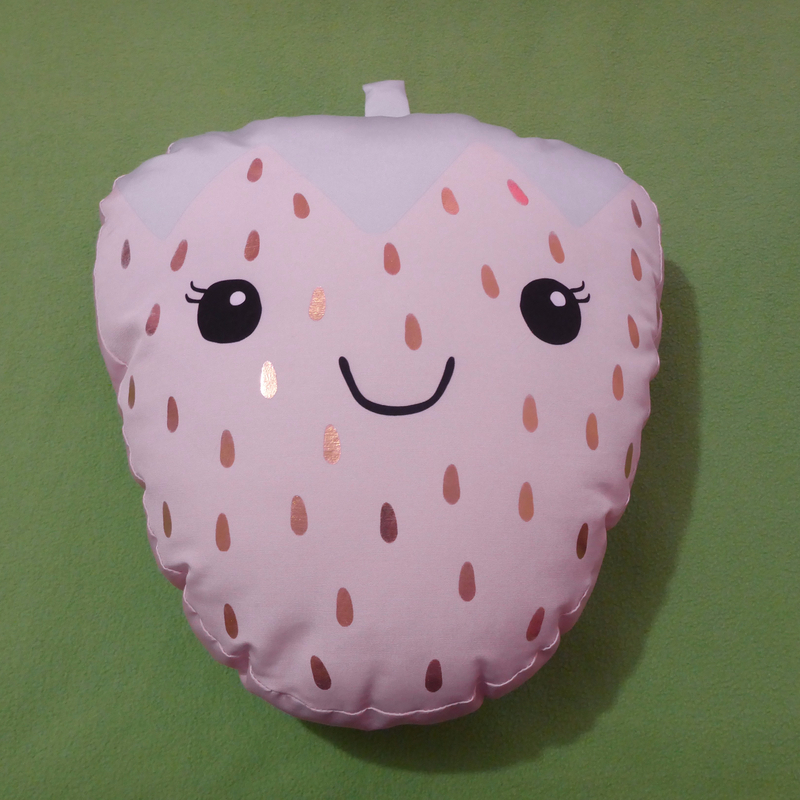 Image Description: a pale-pink squishable strawberry sitting next to a large apple with a spectrum of colour, it ranges from dark-blue at the bottom, blue and light-blue in the middle, with purple up the top with black squishable stem. There are specs of white dotted randomly across the surface of the apple. The Galaxy Apple is very soft and squishable, and when it’s squished, it’s slow rising. The skin is shinny and scented, but the scent isn’t particularly strong (or at least not by my standards). I have to hold the apple up to my face to smell it. I’m certain that the scent will fade away when given the proper airing time. There’s a picture below of what the apple looks like when crushed inside a fist. Image Description: a pale hand crushing a large apple with a spectrum of colour, it ranges from dark-blue at the bottom, blue and light-blue in the middle, with purple up the top with black squishable stem. There are specs of white dotted randomly across the surface of the apple. I was concerned that the “shiny” paint might come off on my hand when I crushed it, but this was unfounded, no paint has come off or faded since I’ve obtained the apple and began playing with it. 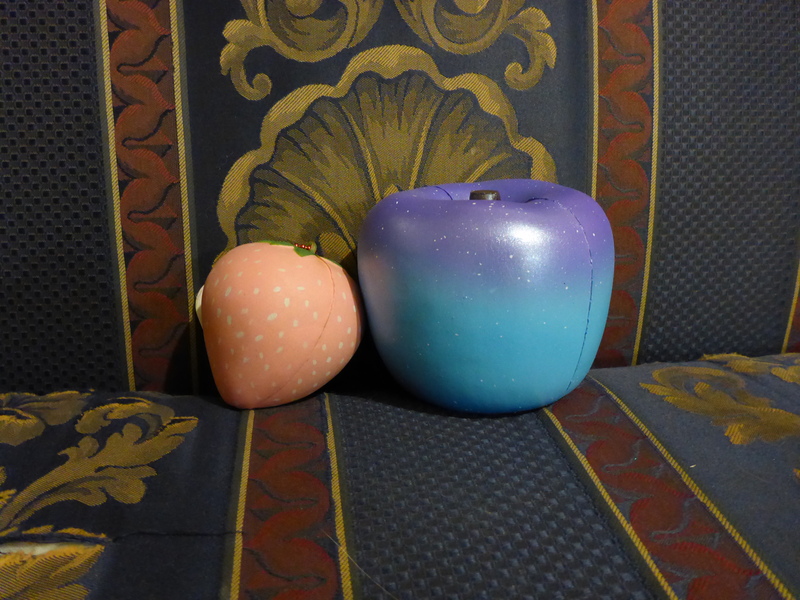 In conclusion, while I do have penchant for large type of squishable stim toy, I really enjoy the Galaxy Apple. The colours are lovely, but I think it’s the softness of the apple that confirms it as an excellent choice (my squishable colossal peach is firmer by comparison).